With my Daddy is a fun book that explores the different ways in which a dad helps their little ones each day. 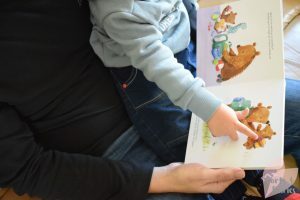 Whether that’s sharing breakfast together, being out and about on an adventure, or pretending that a frisbee’s a spacecraft at the park, it’s a book that highlights how important dads are in our children’s lives. 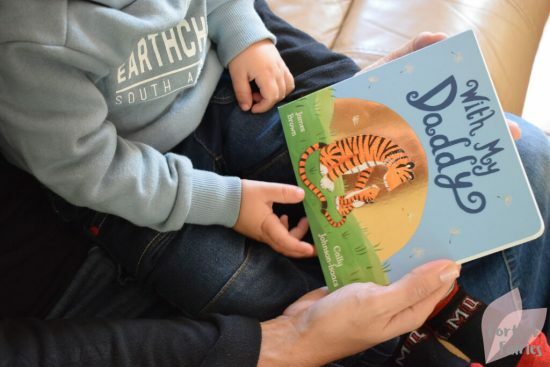 The book is beautifully illustrated and features a daddy tiger with his little cub along with a shiny gold setting sun and gold-lined dandy-lions floating against a blue sky on the cover. 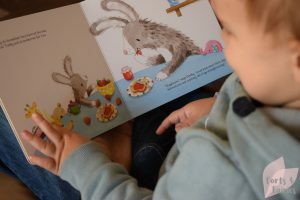 Each page of the story has a different kind of animal featured as the daddy and little one, this ranges from tigers to rabbits, from bears to turtles, and even dogs and lions. Even though the activities shared with each of the animal pairs are different, they are all made fun when shared with dad. From cleaning and pretending the duster is a microphone, to tidying up together and playing pirates in the bath, your little one will enjoy the fun illustrations and rhyming text. With my Daddy highlights the special relationship between dad and child, and it would make a great gift for Father’s Day for your children to read together with their dad during story time. With my Daddy is available at a recommended retail price of R145 from bookstores and online retailers. It’s recommended for children aged three to five years. Thanks to Pan Macmillan for letting us share this special story during our own story time.